How to view and download a full list of available client services (Connect). Use this page to see a list of products and services that your clients can purchase. Click on each item for more information (displayed at the foot of the page). Find it in the menu bar at the top of the page. Name: This is the name of the available product or service. Cost: Cost is the cost of essensys' products to you and will not be visible to clients. Price: This is the price that your clients pay for the product or service. This will be displayed to clients in their Connect interface. You can also download a this as a list by clicking the Download PDF link at the top of the table that links to a separate PDF page that can be shown to clients showing all services. 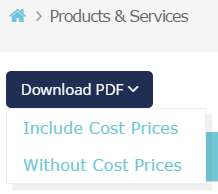 There are options to Include Cost Prices or to download Without Cost Prices. The Export link on the bottom right of the page downloads an excel spread sheet displaying products and services, costs and prices.